German Shepherds are big dogs that are extremely strong. Taking a GSD outdoors without a leash on can become a huge problem for both the dog and the people around it. 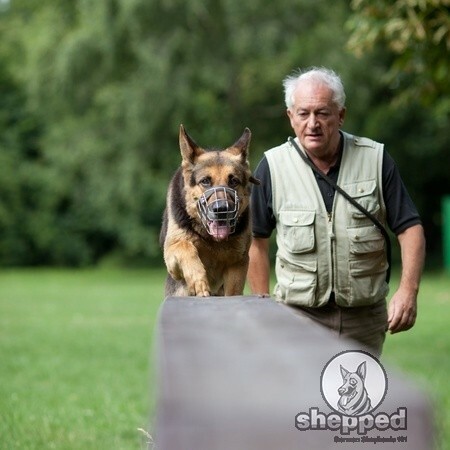 GSDs are not aggressive if trained to behave and obey the owners. Early socialization is another reason for GSDs to stay in control and remain calm around other people and animals. However, if you fail to train your dog to behave in its early age, you will face behavioral issues with your dog and soon realize that your GS cannot do well without a leash. No matter how well behaved or obedient your dog is, you will need to train it to walk on with a leash. Owners of GSDs face a lot of problems when they take their GSDs out for a walk. Their dog either gets out of control or drags them along. 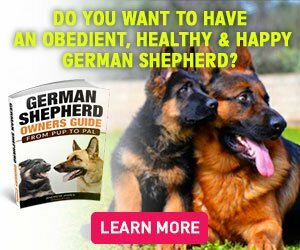 Leash training will help you get hold of your GSD’s actions. When you leash train your GSD, it walks at your pace. Do not assume that your GSD hates to walk on a leash. GSs aren’t against leads; they love to feel comfortable and safe with their owners. Leash training your GS will not be a very easy process as it will require a lot of effort, consistency, and patience. However, leash training becomes extremely easy when you take help from treats and dog toys. Remember to praise your dog whenever it listens to you or perform well. It will encourage your GS, and it will learn your techniques well. There are a variety of leads and collars available in the market. However, not every leash that looks great is good for your German Shepherd. The choice of leash and collar you make depends entirely on your dog. 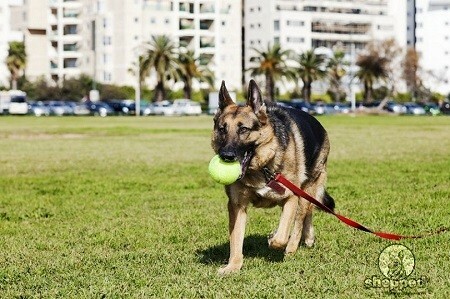 As GSDs are strong and athletic, they will need a stronger leash and collar. You will need to make sure that the leash and collar you choose isn’t hurting your dog. Some materials are harsh for a dog’s neck and may cause skin allergies and wounds. Slip collar leads are best for GSDs that create troubles during the walk. These leads will help you get a better control over your dog. If your dog tries to struggle and run towards other animals in the park, just pull the leash from sideways. Do not pull the leash from the back as your dog will apply the same force in forward direction. However, pulling from the side will keep your dog from running or dragging you along. This collar is a support for a slip collar as it keeps it on top of your dog’s neck. A GSD’s neck is very sensitive, and when you apply a little force on the leash, the collar tightens and makes your dog uneasy. As a result, it stops struggling or misbehaving. If your slip collar doesn’t work too well, you can use pack leader collar to give support to the collar. It works really well for strong GSDs that pull on the leash. Make sure you place the collar on the top of your dog’s neck. Many GS owners place the collar on the lower neck and then complain about the collar being poor. The lower neck of a GS is where its shoulders start. This part of its body is very strong, and when you try to stop your GS, it will apply full force and pull you forward. Nylon Leash is easier to carry and lighter in weight but isn’t appropriate for a big dog like GS. Thin plastic leads are easier to carry, but they cannot control a huge GS. Nylon leads can cut through human fingers if the dog tries to struggle. Leather leads are most suitable for a strong GS. Leather leads are stronger and durable. Leather leads last for a long time, and they can be polished frequently. There are different types of collars and leashes available in the market. Choose a leash and collar that is safe for you and your dog. Do not buy a leash that might hurt you or your dog instead of controlling its movements. Choke chains have been used by many dog owners for years. However, choke chains don’t work too well for strong dogs. The purpose of choke chains is to make a correction of your dog’s misbehavior. It is used to train your dog to learn manners. When you yank the chain to make a correction, your GS might not react in a way that you have anticipated. There is a high chance that your GS puts a higher force on the chain, which will result in injury for you and especially for your GS. Choke chains are effective only when they are used by professionals that know the right trick to train their dogs. Martingale collars are flat collars that are twisted twice to give a tighter grip. These collars are not meant for training purposes. These collars can become a problem is used to correct a behavior or by pulling it too tightly. If you pull it too tightly, there is a high chance that you will strangle your GS to death. Martingale collars should be adjusted properly; not too tight and not too lose. This type of collar is a good option if you have learned the technique to use it. Freedom harness has a strap across the front legs which provides easy and relaxed walk for your dog. This harness should be used for GSDs that are well-trained. Flat and rolled collars are the most widely used collars for GSDs. These collars are made up of plastic with a buckle. These collars are good for putting on your dog’s ID, its rabies and license tags. These collars also have a downside to them. They can become a health hazard for your dog if it gets its head stuck in it. Moreover, if you apply force to this type of collar, it may press your GSDs nerves that are responsible for its eye function. The pressing of nerves can cause eye problems in your GSD. Choose the collar and leash wisely as it will either prove to be helpful or hazardous. If you need suggestions on leads and collars, feel free to contact us.